Dr. Dwight Streit is a distinguished professor in the UCLA Henry Samueli School of Engineering and Applied Science and Director of the UCLA Engineering Institute for Technology Advancement. He is Chair of the UCLA Department of Materials Science and Engineering with a joint appointment in the Electrical Engineering Department. 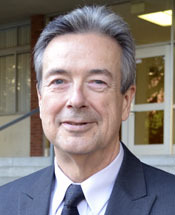 Prior to joining UCLA in 2010 he was Vice President and Technical Fellow at Northrop Grumman Corporation and TRW Space and Electronics. He joined TRW in 1986 and Northrop Grumman in 2002 via the acquisition of TRW. He is a member of the National Academy of Engineering, a Fellow of the Institute of Electrical and Electronics Engineers and the American Association for the Advancement of Science, and a member of the NASA Space Foundation Technology Hall of Fame. He has over 350 technical publications and conference presentations with 22 U.S. and 10 international patents. He received his Ph.D. in Electrical Engineering from UCLA in 1986 and was the UCLA Engineering Alumnus of the Year in 2003.